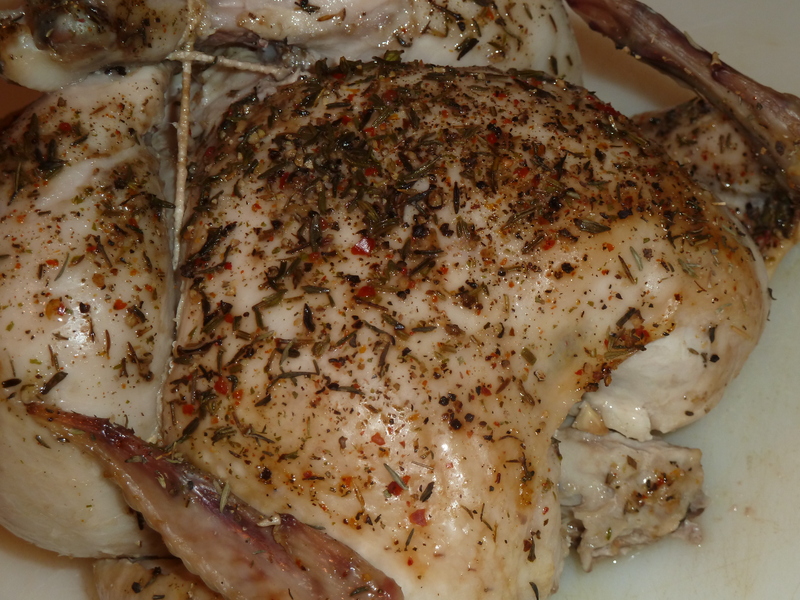 simple sunday: whole chicken in a crock-pot | Is there any wine left? Don’t y’all love those rotisserie chickens from the grocery store? The ones under the heat lamps that are so tender that they fall apart when you look at them? I pick them up all the time to use when I am running short on time but need cooked chicken for a dish. In fact, our H-E-B just started selling rotisserie breasts! Which I love because I am not a dark meat person. Anyway, my favorite thing about them is the way they fall apart and though I love a good oven-roasted chicken, I can’t get the meat quite as tender as the store-bought ones. After telling a friend about my feelings on this topic, she suggested I make my roasted chicken in the crock pot. I had never thought of that but I got just the results I was looking for. The chicken was tender, flavorful and incredibly moist. The best part is that I also got 6 cups of homemade stock out of it. Cut an onion into large chunks and scatter them on the bottom of the crock pot. Salt and pepper the chicken and add any other spices you would like all over the outside of the chicken. I used salt, pepper, thyme, rosemary and red pepper flakes. You could do anything you want here — cumin and chili powder with limes for a Mexican chicken, herbs de provence and dried lavender for a country French taste, or make Greek chicken with a rub of yogurt, garlic, oregano and Cavender’s Greek seasoning. Place the chicken on top of the onion pieces, breast side up. Quarter the lemons and squeeze some of the juice on the chicken and throw the lemon quarters around the chicken in the bottom of the crock pot. Cook on low for 8-10 hours. The legs should pull off of the chicken easily when it is done. Remove the chicken and let rest for 10-15 minutes before carving. 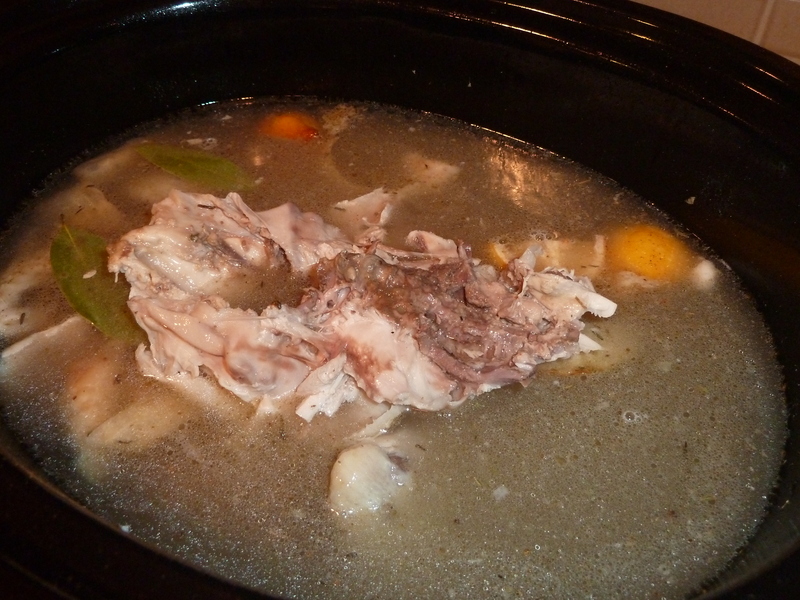 After you have removed all of the meat from the chicken, put the carcass back into the crock pot with the lemons, onions and remaining juices. Add bay leaves, celery, carrots — whatever you have on hand. Fill the crock pot with water and set it to cook on low for another 8-10 hours. Strain the carcass, lemons, onions and other vegetables out of the stock. Let the broth cool and then spoon it into gallon ziplock bags. Freeze until needed. Cut onion into large chunks and scatter them on the bottom of the crock pot. Salt and pepper the chicken and add any other spices you would like all over the outside of the chicken. Place the chicken on top of the onion pieces, breast side up. 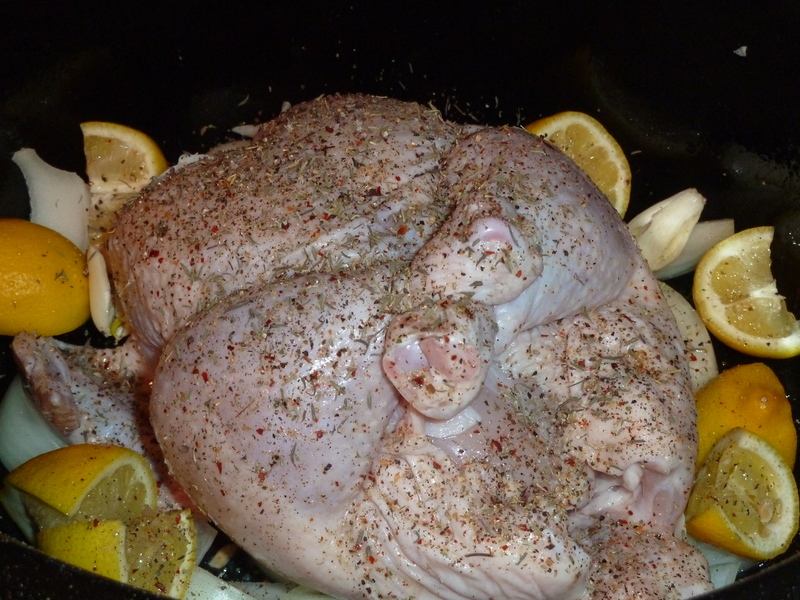 Quarter the lemons and squeeze some of the juice on the chicken and throw the lemon quarters around the chicken in the bottom of the crock pot. Strain the carcass, lemons, onions and other vegetables out of the stock. Let the broth cool and then spoon it into gallon ziplock bags. Freeze until needed. This makes a great base for soups or can be used to cook rice or risotto for extra flavor. 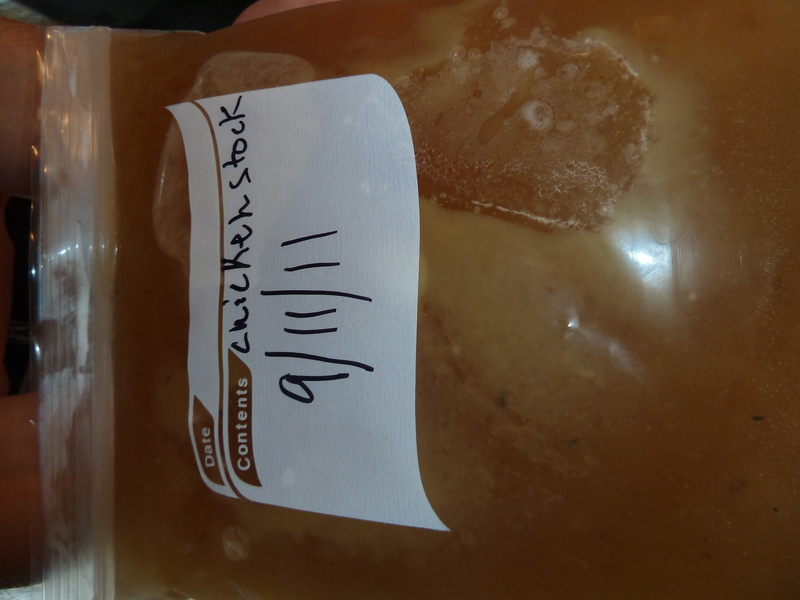 Tip: when freezing broth, soup or other liquids, put it into a gallon ziplock and freeze it on its side. It can then be stored more easily (can be shoved into a small corner of the freezer) but it also has the benefit of defrosting more quickly than if it is frozen in a big block (like in a tupperware).